Lights On Lake Orion – More Christmas lights for a cause! This FREE giant holiday lights display located in Lake Orion benefits The Daisy Project. Daisy Project is a local non-profit that helps families with special needs children obtain medicine and recreational equipment not covered by insurance. Their work raises awareness and makes the world more accessible for children with special needs. Lights On is located at 439 Shady Oaks in Lake Orion, MI 48362. Lights On Lake Orion features around 20,000 Christmas lights synchronized to holiday music. The show is free but donations are accepted for the Daisy Project 501-3C. The holiday light show’s hours are Sunday through Thursday from 5p-10p and 5p-11p on Saturday and Sunday. You can catch the light show every year from Thanksgiving through New Year’s Day. 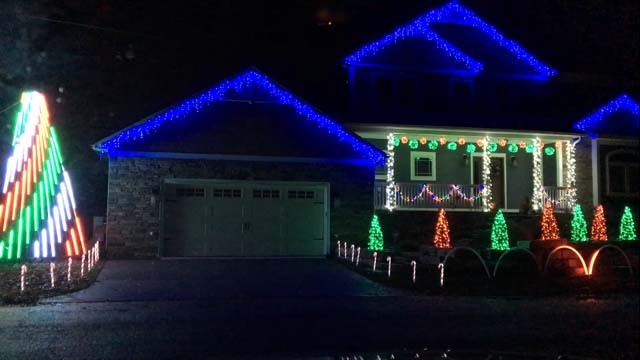 There is another Holiday Lights for a Cause home worth checking out. Check out Our Dancing Lights in Auburn Hills which benefits Rainbow Connection. To learn more about The Daisy Project, visit www.thedaisyprojectmi.com. This page is intended to be used as a guide. Oakland County Moms does not endorse these events. Oakland County Moms is not responsible for changes to event descriptions, event times or details being altered without notice or cancellations. See our EVENTS / THINGS TO DO tab for more Christmas and Holiday events, activities and things to do in Metro Detroit and Oakland County, Michigan.